Twitter activist encourages people to target random elderly woman's "grandkids, friends, old coworkers, & extended family." After their attack on the young boys of Covington Catholic High School failed, the Twitterati have picked a new target. Twitter activist Simar Ahluwalia, who describes himself as a "USC alum" and the "Child of [Indian] Immigrants," on Sunday shared a 37 second video -- devoid of all context -- of a black woman filming a random old white lady who appears to be suffering from dementia stammering out something "racist" (while literally struggling to speak). Knowing full well the power the "systematically oppressed" Twitterati have to destroy people (who do not enjoy the same systemic power) through their hysterical lynch mobs, Simar Ahluwalia wrote, "Twitter, do your thing & expose this woman for the racist that she is" and encouraged the mob to target her "grandkids, friends, old coworkers, & extended family." Appalling that no one spoke up to be an ally to this woman. If you see any form of bigotry or injustice please say something. Your age & where you grew up are not excuses for racism. Acknowledging the old white lady is not likely to have any online presence, Ahluwalia said people should target her "grandkids, friends, old coworkers, & extended family." I bet the online presence of her grandkids, friends, old coworkers, & extended family isn�t. Her house was definitely Slytherin. It�s sad because it looks like this woman lived through WW2, you figure she would�ve seen where hate & bigotry lead us & rejected it. Hers is the same generation that fought against Nazis. Her hate isn�t contingent upon when she was born because so many from her generation have fought for the right thing. Here�s another video of these kids harassing this Native American protestor. The ignorance, the bigotry, is infuriating. This is not the future of this nation. 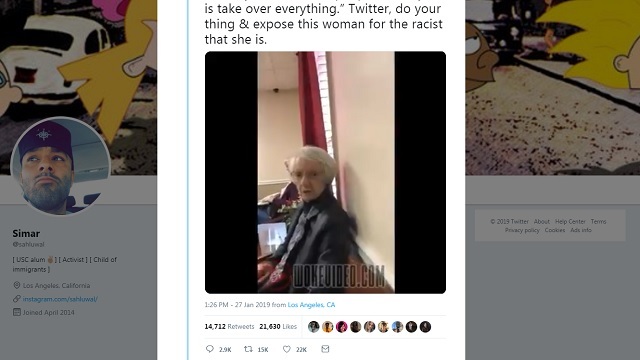 Every single day, with Twitter CEO Jack Dorsey's full backing, the Twitterati form a new lynch mob to go after the various enemies of prog-globalism -- whether it be some white kids smiling in the Covington Catholic case or in this case just a random old lady with zero systemic power who appears to have dementia. Meanwhile, Twitter will seemingly ban you instantaneously for poking fun at laid off liberal journalists by telling them to "learn to code."